Looking for an affordable concrete cleaning company in the Mobile, AL area but expect top-quality service? SoftWasherz is your local residential and commercial concrete cleaning contractor. Whether we are cleaning the concrete of your driveway, sidewalk, entranceway, stairs, patio, pool deck, or curbs, you can expect top-quality workmanship and excellent results from our services. Let us lift and remove all those dark concrete stains that make your place look bad. 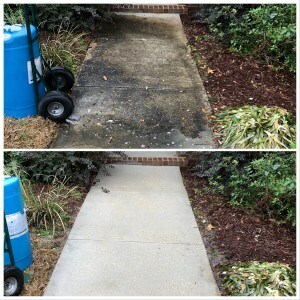 Our power washing company uses very effective methods to remove gum, rust, algae, mildew, grease, drink spills, and all the other stains from your concrete surfaces. The last thing anyone wants is to have someone slip and fall because the concrete surface is slippery. The most common cause of the slimy algae growth is high humidity and shade. These areas of your sidewalk or entryway make accidents happen. Hire our concrete cleaning professionals today to rid the surfaces of the slippery mess. With all the humidity in our Gulf Coast climate, cleaning concrete regularly is important to avoid algae. Our power washing technicians can use an algaecide which retards the growth of algae and other microorganisms. The softwashing solutions we use to clean roofs is just as effective to treat your concrete surfaces. This allows you to wait a longer amount of time before cleanings. Just ask about our soft wash treatment for your concrete. If you are looking for concrete cleaning services for your Mobile, AL area home or commercial business, please call 251-263-5057 complete our online request form.